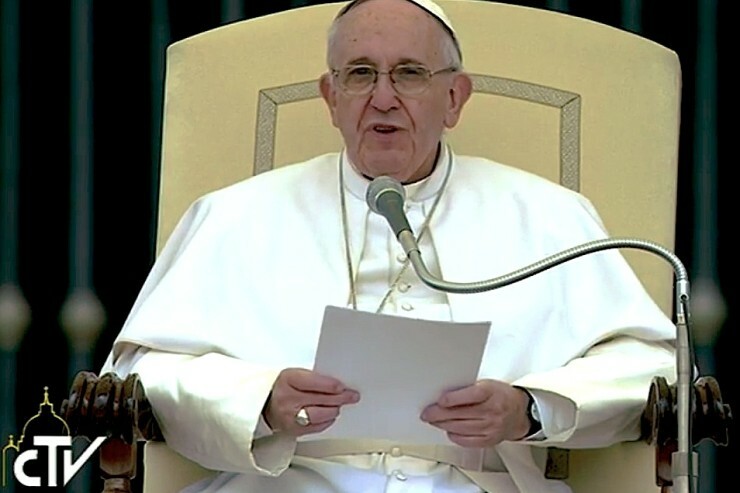 Speaker: Dear Brothers and Sisters: Throughout this Jubilee Year, we have reflected on God’s mercy and our own responsibility, as followers of Jesus, to be “merciful like the Father”. In this light, we now turn to the dialogue of Jesus and the Samaritan woman (cf. Jn 4:6-15). Through dialogue, in fact, we come to know and respect others; we come to see each individual as a gift of God. How much we need to encourage dialogue in our families, our schools and our workplaces! For only through dialogue can we truly understand others and their needs, and work together for the good of society and the care of our common home. Dialogue between the religions can make a real contribution to the building of a world of peace and solidarity. God has placed a seed of goodness in each of us and he asks us to use it in the service of his creation. Through dialogue, mutual acceptance and fraternal cooperation, may we make God’s merciful love ever more evident in our world. Speaker: I greet the English-speaking pilgrims and visitors taking part in today’s Audience, particularly those from England, Scotland, Indonesia, Malaysia and the United States of America. With prayerful good wishes that the Jubilee of Mercy will be a moment of grace and spiritual renewal for you and your families, I invoke upon all of you joy and peace in our Lord Jesus Christ.